Dirk Valentine was the sweetheart of Frances Humber, whose family originally owned Shadow Ranch. Now, here’s the rub. Dirk was an outlaw, and Frances’ father was the local sheriff. Knowing that his days were numbered, Dirk hid his fortune and tried to get word to Frances to tell her where it was. But then a most unfortunate thing happened. Her father shot and killed Dirk. 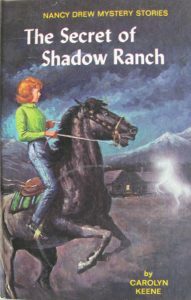 OK, let me stop for a minute here to tell you that Shadow Ranch was always one of my favorite Nancy Drew Mystery Stories. For a child growing up in the suburbs, this book was an exciting escape to a world of rattlesnakes, deserts, rodeos and Indian cliff dwellings. The story held so much adventure, almost every chapter ended with an exclamation point. The story begins with Nancy joining her chums for an exciting vacation at Shadow Ranch. But the girls quickly get more excitement than they bargain for when a phantom horse appears. A phantom horse, you ask? I’ll let Bess Marvin tell you that part of Dirk Valentine’s legend. Why send a horse to do a man’s job? And for that matter, was his horse even dead? If the horse wasn’t dead, then how could Dirk guarantee that it would come back as a phantom when it did die? And if it was already dead, well, how could he guarantee it even then? Can you force a dead horse to come back as a ghost if he doesn’t want to? I didn’t think of these things when I was seven.